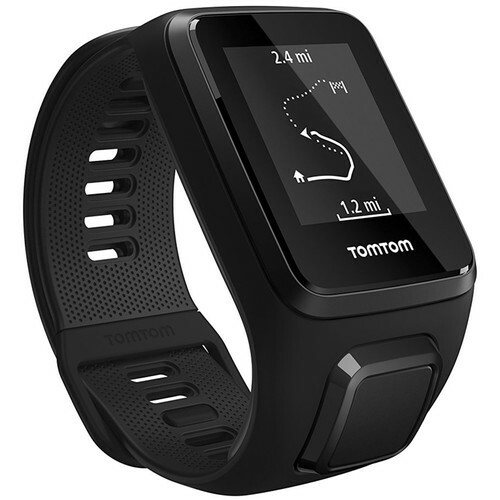 Workout smart with the small Spark 3 Fitness Watch in black from TomTom. This activity-tracking watch uses a combination of motion sensors, GPS, and an accelerometer to count your steps, distance traveled, calories burned, and total active minutes. GPS enables route tracking, so you can retrace your steps. You can set up goals on-device to track your daily and weekly progress and see how your activity levels improve. Automatic sleep tracking is also onboard, so you can monitor the quality of your rest. In addition to daily activity and sleep monitoring, the Spark 3 is also a comprehensive multi-sport tracker. With it, you can record multiple data points for various sporting activities, including indoor and outdoor running, indoor and outdoor cycling, swimming, and more. You can even use the Spark 3 as a training tool, harnessing its various modes and audio performance feedback to help improve your performance. The Spark 3 is equipped with GPS, which it utilizes along with its compass to ensure your outdoor distance calculation is accurate. Bluetooth LE technology is also onboard for communicating with compatible applications. Its rechargeable battery is designed to last up to 3 weeks in activity tracking-only mode and up to 11 hours with the GPS turned on. Capture your steps, active minutes, and calories burned. The Spark 3 can track metrics for a number of sports and activities, including running, cycling, and swimming. Set goals and track your progress on the device or with your favorite compatible apps. Use the Spark 3 to track your sleep and find out if you're getting all the rest you need. The Spark 3 is equipped with GPS technology, so you'll get more accurate data tracking. It records time, distance, speed, pace, and your route — providing live stats on the go. The Spark 3 uses Bluetooth LE technology to wirelessly sync with your favorite compatible apps. You can change your strap color to match your workout gear or personal style. Additional straps are sold separately. Box Dimensions (LxWxH) 5.8 x 3.3 x 3.2"